San Clemente Shutters - A Modern Twist To Wood - OC Shutters Inc.
San Clemente Shutters, when you think plantation shutters the first thing that usually comes to mind is a very traditional look, but think again. 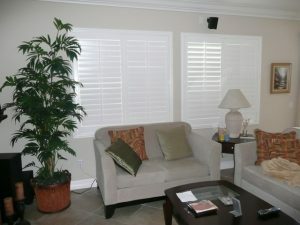 Our San Clemente shutters have so many options to choose from that they have become a perfect window treatment. For every home even this modern home in San Clemente, CA. We got the opportunity to work with this wonderful family in the ever growing city of San Clemente. We took the customers modern visions for her home and transformed her windows into not only great window treatments with custom San Clemente shutters, but works of art. These shutters were finished in a fine stain color to enhance the look of the natural grain of the wood, yet the dark stain makes for a bold statement against her gray and yellow wall colors. In addition we chose to add the hidden tilt option to the beautiful wood San Clemente shutters to enhance the modern look even more. With the 3 1/2″ louvers that we chose together the customer had allot of natural light entering through the windows giving them an enhanced artistic glow. Another innovative option that the customer simply loved is the spliting of the hidden tilt bar in half adding even more versatility to her vision. This feature allows her to either open them all, or just the top or bottom giving her endless light control. The frames that we decided on were a sleek Z frame that not only added a decorative molding effect around the windows, but still stayed in line with the modern design concept. The client was so excited when we chose out the original design, but was not sure what to do about the round window in her master bedroom that was allowing allot of light into the room. Much to her surprize we were able to make a custom specialty shaped shutter for circle port hole window. To add to her excitement she learned that she could even open and close the louvers to control the light and even with our very strong hidden recessed magents she can even remove the shutter panel to clean the window. The end result was a customer that was very estatic with her shutters and that we were able to add a modern twist to traditional San Clemente shutters.